Dream Yacht Charter is the largest yacht charter operation in Noumea, with a fleet of catamarans (sail and power) and monohulls available for charter with or without a skipper. They also have small power boats for fishing in the New Caledonia lagoon. There are also a multitude of skippered yachts available from individual yacht owners and smaller yacht charter companies. 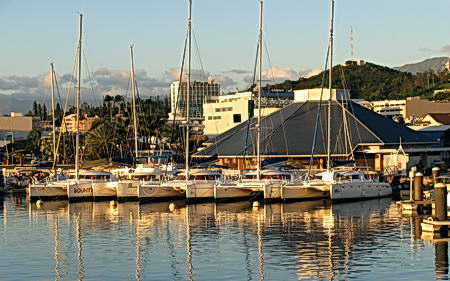 Almost all yacht charter operations are based in Noumea, either at Port Moselle Marina in downtown Noumea or at Port Sud Marina. Below is the Port Moselle Marina Commercial wharf with the fleet of charter catamarans of Dream Yacht Charter lined up ready for rental. You don't need any licence or documents to charter a yacht bareboat in New Caledonia.